Caroline Cox takes fashion lovers on an exquisite journey through the most stylish footwear of the twentieth century. Vintage Shoes illuminates the crucial designers, key technical breakthroughs, and varied cultural influences that have shaped shoe fashion for the last hundred years--from Andre Perugia's designs for society women in the 1920s to the Christian Louboutin red-soled shoes favored by celebrities today, and including designs by Salvatore Ferragamo, Charles Jourdan, Roger Vivier, Beth Levine, Vivienne Westwood, Manolo Blahnik, and others. Lavish fashion photography, specially commissioned photographs of rare period footwear, and a unique shopping guide--with tips on sourcing and caring for articles of vintage fashion--help make Vintage Shoes an unforgettable tour through a dazzling corner of haute couture history. Decade by decade, Vintage Shoes recounts more than one hundred years of the history of shoe design, highlighting the key designers and cultural influences that have shaped shoe fashions throughout the century. Vintage Shoes includes stunning fashion photography, specially commissioned photographs of period footwear, and the most collectible, exquisite, and fabulous shoe designs. As a bonus, a shopping and collecting guide offers pointers on sourcing and caring for vintage footwear, along with a glossary of shoe designers such as Salvatore Ferragamo, Manolo Blahnik, Vivienne Westwood, and many others. 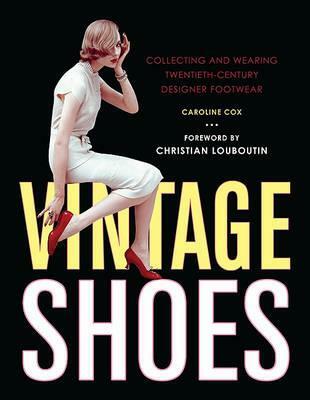 This book is a must-have guide for those interested in collecting and wearing vintage shoes.